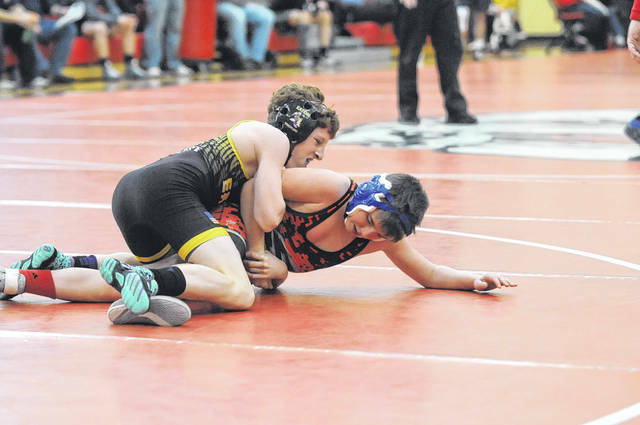 Eaton freshman Owen Hewitt (top) battles Preble Shawnee’s Jackson Carter during the Southwestern Buckeye League wrestling tournament on Saturday, Feb. 17, at Milton-Union. Hewitt placed third to help Eaton to a runner-up finish. 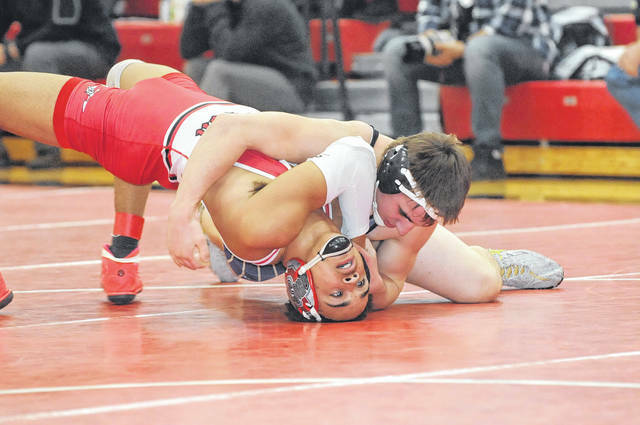 WEST MILTON — Eaton wrestling coach Mark Silvers left the Southwestern Buckeye League tournament last weekend at Milton-Union frustrated. Having won six straight division titles the Eagles had to settle for runner-up this season behind champion Valley View. Eaton tallied 153 points to the Spartans 219. Eaton had two individual champions and two runner-ups. At 132 pounds, Wade Monebrake improved his record to 37-2 while winning his first SWBL championship with two pins and winning 14-5 in the final match. 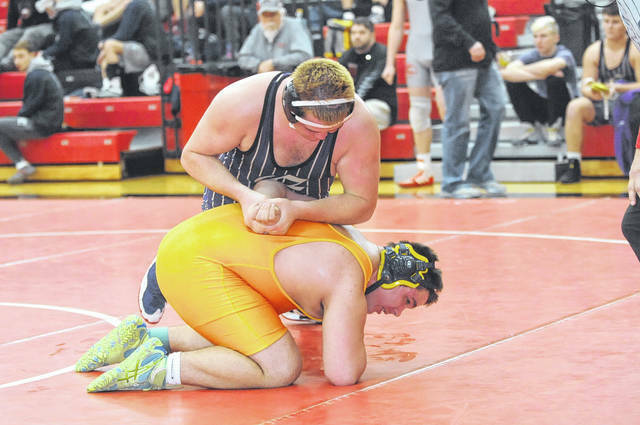 At 182, Spencer Reynolds won his first SWBL title. “He had a great tournament winning two matches by pins, his semis match 14-4 and then 2-0 in the finals. He has been putting in extra work and it’s showing. 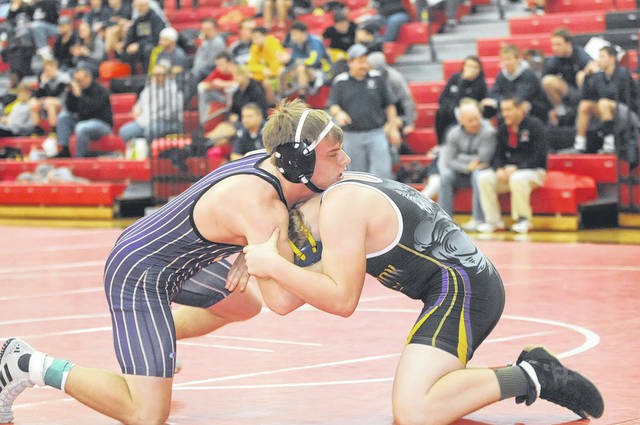 I’m very excited for his sectional tournament,” Silvers said. At 160, Seth Hodapp made it into his first championship final and finished second. Silvers said Hodapp has had a good year and is poised to finish very well. At 285, Seth Bowman was second, losing to Trent Wilson of Valley View. At 106, Owen Hewitt overcame his usual terrible draw, according to Silvers. He lost his opening match to the eventual champion, 11-0. Then showed his grit by wrestling back through the consolations to finish third. Silvers said this was Hewitt’s first tournament place in high school and like the whole team is peaking at the right time. At 145, Logan Chapin stepped up and finished sixth. Silvers said Chapin has overcome a knee injury to return and be an important part of the team. 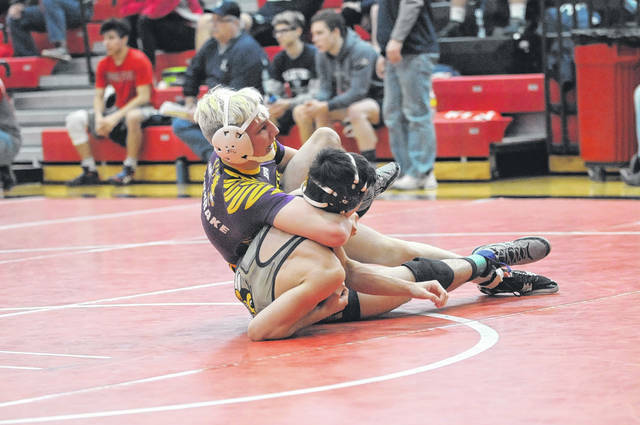 At 152, Zac Schmidt placed fourth, marking his first placing in a high school tournament. “Zac does nothing but improve every time he steps on the mat. Gaining confidence and learning to compete,” Silvers said. At 170, Skylar Straszheim placed fifth and gained valuable experience. “He knows what he needs to do in order to have a good weekend next week,” Silvers said. At 195, Christian Michael placed sixth. “His improvement this year has been huge and is in a good place coming into sectional,” Silvers said. At 220, Tyler Schmidt had a good tournament placing third. He lost a disappointing match in the semis, then rebounded to win 2-1 in overtime in the consolation semis and then 4-1 in the final match. “Tyler has stepped up his intensity and is ready for our sectional,” Silvers said. Kameron Sandifer (126) and Cameron Schmidt (138) competed and learned what it’s going to take to advance at the sectional, according to Silvers. Eaton will travel to Graham this weekend for the Division II sectional tournament. Wrestling will begin Friday, Feb. 23 at 5:30 p.m. Wrestling is scheduled to begin on Saturday at 10:30 a.m. Saturday’s final session is scheduled for approximately 2:30 p.m.
“This group has grown and improved all season, now it’s time to step up to the line and see where we are. They’ve put in the work, now it’s time to shine,” Silvers said.